This high quality, very detailed set of metadata was written by James Neill with help from Michelle Williams-Ward. Michelle as an osteology expert was able to ensure that the medical terms used are accurate and that the catalogue works well for typical palaeopathological research themes. The archive will also have much to offer anyone with an interest in medical history, anthropology, or the history of East Anglia. Thank you to James and Michelle for their excellent work. Thanks too of course to the Wellcome Trust for funding the Putting Flesh on the Bones project. Special Collections staff (Alison, Martin and James) would like to wish all our users, colleagues, and other friends a Merry Christmas and all the very best for 2018. Our seasonal image highlights our Putting Flesh on the Bones project, which will make a wonderful archive available to researchers and the public. If this intrigues you, check out the project blog. Please note that we are closed for the Christmas break from 22 December to 2 January. We look forward to sharing more archive adventures with you in 2018! Welcome to our new Archivist! Meet James Neill, who has just joined Special Collections as Project Archivist. James will be with us for 18 months, working on the Wellcome-funded ‘Putting Flesh on the Bones Project’, a collaboration between Special Collections and Archaeological Sciences. Working closely with the rest of the project team, James will be cataloguing, digitising, preserving, and promoting the rich and unique archive of pioneering palaeopathologist Dr Calvin Wells. He will be based in Richmond Building but will also be seen around Special Collections. James received his archive qualification from the University of Glasgow in 2013. Since then he has worked for all kinds of arts, heritage and academic organisations, including the Mercers’ Company, London Metropolitan Archives and the University of Arts London, and on collections ranging from the Estate Papers of Sir Richard Whittington to the counter-cultural comic books of Robert Crumb. This wide experience will be very helpful in navigating the complications of the Wells material! Find out more about him on his staff webpage. Calvin Wells (1908-1978) is often referred to as the father of palaeopathology: he used his medical training to shed light on the diseases and physical problems found in skeletal remains. Special Collections holds his archive and his library of over 800 books. The title of his well-known work, “Bones, bodies and disease”, sums up many of the books e.g. 17th and 18th century medical texts, particularly on gynaecology and obstetrics, by authors such as Thomas Sydenham, Francois Mauriceau and William Smellie. 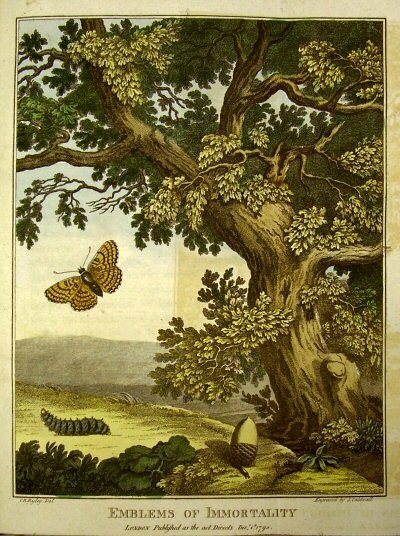 This illustration depicts “Emblems of Immortality”, caterpillar to butterfly and acorn to oak, from “Philosophy of medicine” by Robert Thornton, published 1799-1800. The collection also includes modern works on archaeology and anthropology, practical medical and nursing works, and books on exotic travels. A few recurring themes: ear, nose and throat medicine, the archaeology of Norfolk, where the Wellses lived in later life, ancient tribes such as the Aztecs, and medical biography, whether of doctors or of famous individuals. All these books appear on the Library Catalogue, and can be easily found using keyword search and limiting by Special Collections.